Marrickville. The charm of the urban inner city with the food and drink of the world. Sydney’s early history blended with modern life to create a stunning and unique slice of Australia. All this and more on your door step so what’s holding you back? If the answer is pain and discomfort in your back or neck then you need Sydney Wide Chiropractic who can help you find the solutions you have been looking for. 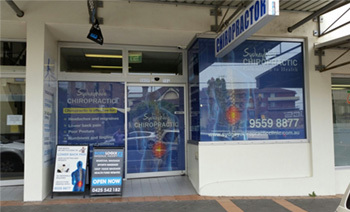 When you visit us, your chiropractor in Marrickville, you will receive the safest and most advanced chiropractic care available. Our techniques are designed specifically to help restore your bodies balance and encourage a healthy nervous system coordinating with a mobile and flexible spine. We don’t simply chase the symptoms you may be displaying, instead we find effective and lasting solutions that solve the core of your pain, giving you a new wellness and vitality each and every day. Our team of accredited and clinically experienced chiropractors are dedicated to aiding you when it comes to your health, we don’t use generic widespread approaches simply to attract customers, instead we focus on the individual needs you need and work towards targeted and achievable health goals that put the power of your own health back in your hands. Regardless of the type of pain you’re experiencing, from back or neck pain stemming from nerve or spinal imbalances to more long term issues like sports injuries, RSI or chronic pains, we have the answers that will return you to the body you deserve. As the leading chiropractor in Marrickville we recognize that your body is capable of self-healing and self-regulating and it is our mission to return that power to you with education and rehabilitation programs that don’t simply paper over the problems, but actively engage you in the healing process and guide you towards a better body and mind. Your health is important to us and that’s why you deserve the best healthcare available, so if you’re looking for a change then contacts us today on (02) 9559 8877 or email us at info@sydneychiropracticclinic.com.au and organise your first treatment now.